A laser diode, (LD), injection laser diode (ILD), or diode laser is a semiconductor device similar to a light-emitting diode in which the laser beam is created at the diode’s junction. Laser diodes are the most common type of lasers produced, with a wide range of uses that include fiber optic communications, barcode readers, laser pointers, CD/DVD/Blu-ray disc reading/recording, laser printing, laser scanning and light beam illumination. Many scientific, military, medical and commercial laser applications have been developed since the invention of the laser in 1958. The coherency, high monochromaticity, and ability to reach extremely high powers are all properties which allow for these specialized applications. Laser based lidar (LIght raDAR) technology has application in geology, seismology, remote sensing and atmospheric physics. In astronomy, lasers have been used to create artificial laser guide stars, used as reference objects for adaptive optics telescopes. Lasers may also be indirectly used in spectroscopy as a micro-sampling system, a technique termed Laser ablation (LA), which is typically applied to ICP-MS apparatus resulting in the powerful LA-ICP-MS. The principles of laser spectroscopy are discussed by Demtröder. Most types of laser are an inherently pure source of light; they emit near-monochromatic light with a very well defined range of wavelengths. By careful design of the laser components, the purity of the laser light (measured as the “linewidth“) can be improved more than the purity of any other light source. This makes the laser a very useful source for spectroscopy. The high intensity of light that can be achieved in a small, well collimated beam can also be used to induce a nonlinear optical effect in a sample, which makes techniques such as Raman spectroscopy possible. Other spectroscopic techniques based on lasers can be used to make extremely sensitive detectors of various molecules, able to measure molecular concentrations in the parts-per-1012 (ppt) level. Due to the high power densities achievable by lasers, beam-induced atomic emission is possible: this technique is termed Laser induced breakdown spectroscopy (LIBS). Heat treating with lasers allows selective surface hardening against wear with little or no distortion of the component. Because this eliminates much part reworking that is currently done, the laser system’s capital cost is recovered in a short time. An inert, absorbent coating for laser heat treatment has also been developed that eliminates the fumes generated by conventional paint coatings during the heat-treating process with CO2 laser beams. One consideration crucial to the success of a heat treatment operation is control of the laser beam irradiance on the part surface. The optimal irradiance distribution is driven by the thermodynamics of the laser-material interaction and by the part geometry. Typically, irradiances between 500-5000 W/cm^2 satisfy the thermodynamic constraints and allow the rapid surface heating and minimal total heat input required. For general heat treatment, a uniform square or rectangular beam is one of the best options. For some special applications or applications where the heat treatment is done on an edge or corner of the part, it may be better to have the irradiance decrease near the edge to prevent melting. When the Apollo astronauts visited the moon, they planted retroreflector arrays to make possible the Lunar Laser Ranging Experiment. Laser beams are focused through large telescopes on Earth aimed toward the arrays, and the time taken for the beam to be reflected back to Earth measured to determine the distance between the Earth and Moon with high accuracy. Some laser systems, through the process of mode locking, can produce extremely brief pulses of light – as short as picoseconds or femtoseconds (10−12 – 10−15 seconds). Such pulses can be used to initiate and analyze chemical reactions, a technique known as photochemistry. The short pulses can be used to probe the process of the reaction at a very high temporal resolution, allowing the detection of short-lived intermediate molecules. This method is particularly useful in biochemistry, where it is used to analyse details of protein folding and function. Laser barcode scanners are ideal for applications that require high speed reading of linear codes or stacked symbols. A technique that has recent success is laser cooling. This involves atom trapping, a method where a number of atoms are confined in a specially shaped arrangement of electric and magnetic fields. Shining particular wavelengths of light at the ions or atoms slows them down, thus cooling them. As this process is continued, they all are slowed and have the same energy level, forming an unusual arrangement of matter known as a Bose–Einstein condensate. Some of the world’s most powerful and complex arrangements of multiple lasers and optical amplifiers are used to produce extremely high intensity pulses of light of extremely short duration, e.g. laboratory for laser energetics, National Ignition Facility, GEKKO XII, Nike laser, Laser Mégajoule, HiPER. These pulses are arranged such that they impact pellets of tritium–deuterium simultaneously from all directions, hoping that the squeezing effect of the impacts will induce atomic fusion in the pellets. This technique, known as “inertial confinement fusion“, so far has not been able to achieve “breakeven”, that is, so far the fusion reaction generates less power than is used to power the lasers, but research continues. Confocal laser scanning microscopy and Two-photon excitation microscopy make use of lasers to obtain blur-free images of thick specimens at various depths. Laser capture microdissection use lasers to procure specific cell populations from a tissue section under microscopic visualization. Additional laser microscopy techniques include harmonic microscopy, four-wave mixing microscopy and interferometric microscopy. Military uses of lasers include applications such as target designation and ranging, defensive countermeasures, communications and directed energy weapons. Directed energy weapons are being developed, such as Boeing’s Airborne Laser which was constructed inside a Boeing 747. Designated the YAL-1, it was intended to kill short- and intermediate-range ballistic missiles in their boost phase. Another example of direct use of a laser as a defensive weapon was researched for the Strategic Defense Initiative (SDI, nicknamed “Star Wars“), and its successor programs. This project would use ground-based or space-based laser systems to destroy incoming intercontinental ballistic missiles (ICBMs). The practical problems of using and aiming these systems were many; particularly the problem of destroying ICBMs at the most opportune moment, the boost phase just after launch. This would involve directing a laser through a large distance in the atmosphere, which, due to optical scattering and refraction, would bend and distort the laser beam, complicating the aiming of the laser and reducing its efficiency. Another idea from the SDI project was the nuclear-pumped X-ray laser. This was essentially an orbiting atomic bomb, surrounded by laser media in the form of glass rods; when the bomb exploded, the rods would be bombarded with highly-energetic gamma-ray photons, causing spontaneous and stimulated emission of X-ray photons in the atoms making up the rods. This would lead to optical amplification of the X-ray photons, producing an X-ray laser beam that would be minimally affected by atmospheric distortion and capable of destroying ICBMs in flight. The X-ray laser would be a strictly one-shot device, destroying itself on activation. Some initial tests of this concept were performed with underground nuclear testing; however, the results were not encouraging. Research into this approach to missile defense was discontinued after the SDI program was cancelled. On March 18, 2009 Northrop Grumman announced that its engineers in Redondo Beach had successfully built and tested an electric laser capable of producing a 100-kilowatt ray of light, powerful enough to destroy cruise missiles, artillery, rockets and mortar rounds. An electric laser is theoretically capable, according to Brian Strickland, manager for the United States Army‘s Joint High Power Solid State Laser program, of being mounted in an aircraft, ship, or vehicle because it requires much less space for its supporting equipment than a chemical laser. On April 6, 2011, the U.S. Navy successfully tested a laser gun, manufactured by Northrop Grumman, that was mounted on the former USS Paul F. Foster, which is currently used as the navy’s test ship. When engaged during the test that occurred off the coast of Central California in the Pacific Ocean test range, the laser gun was documented as having “a destructive effect on a high-speed cruising target”, said Chief of Naval Research Admiral Nevin Carr. Zeus laser weapon Is the first laser and the first energy weapon of any type to be used on a battlefield. It is used for neutralizing mines and unexploded ordnance. Area Defense Anti-Munitions (ADAM) Lockheed Martin experimental fiber laser. 10 kilowatt tested against rockets. Mid-Infrared Advanced Chemical Laser (MIRACL) A U.S. Navy experimental deuterium fluoride laser. Was tested against an Air Force satellite in 1997. In 2011, the U.S. Navy began to test the Maritime Laser Demonstrator (MLD), a laser for use aboard its warships. By 2013, the Navy was announcing active deployment in 2014. Personnel halting and stimulation response rifle (PHaSR) A non-lethal hand-held weapon developed by the United States Air Force  Its purpose is to “dazzle” or stun a target. It was developed by U.S. Air Force’s Directed Energy Directorate. Pulsed Energy Projectile A laser designed for riot control. A laser pulse ablates material causing a shockwave which stuns the targeted individual. Likely truck-mounted. Tactical High Energy Laser (THEL) is a weaponized deuterium fluoride laser developed in a joint research project by Israel and the USA. It is designed to shoot down aircraft and missiles. See also National missile defense. Beriev A-60 A Soviet/Russian CO2 gas laser mounted on an Ilyushin Il-76MD transport. Boeing Laser Avenger Mounted on an AN/TWQ-1 Avenger combat vehicle. Airborne Laser, or Advanced Tactical Laser The U.S. Air Force’s plan to mount a CO2 gas laser or COIL chemical laser on a modified Boeing 747 to shoot down missiles. Laser Weapon System (LAWS), which is intended to hold off approaching unmanned aerial vehicles and speedboats. Under development by the U.S. Navy. The system, which can burn through steel, reportedly costed $40 million and took six years to develop. High Energy Liquid Laser Area Defense System (HELLADS) A counter-RAM aircraft or truck mounted laser under development by General Atomics under a DARPA contract. 150 kilowatt goal. Uses a lasing medium immersed in an index matchedcoolant. Defensive countermeasure applications can range from compact, low power infrared countermeasures to high power, airborne laser systems. IR countermeasure systems use lasers to confuse the seeker heads on infrared homing missiles. Some weapons simply use a laser to disorient a person. One such weapon is the Thales Green Laser Optical Warner. Another military use of lasers is as a laser target designator. This is a low-power laser pointer used to indicate a target for a precision-guided munition, typically launched from an aircraft. The guided munition adjusts its flight-path to home in to the laser light reflected by the target, enabling a great precision in aiming. The beam of the laser target designator is set to a pulse rate that matches that set on the guided munition to ensure munitions strike their designated targets and do not follow other laser beams which may be in use in the area. The laser designator can be shone onto the target by an aircraft or nearby infantry. Lasers used for this purpose are usually infrared lasers, so the enemy cannot easily detect the guiding laser light. Smith & Wesson revolver equipped with a laser sight mounted on the trigger guard. The laser has in most firearms applications been used as a tool to enhance the targeting of other weapon systems. For example, a laser sight is a small, usually visible-light laser placed on a handgun or a rifle and aligned to emit a beam parallel to the barrel. Since a laser beam has low divergence, the laser light appears as a small spot even at long distances; the user places the spot on the desired target and the barrel of the gun is aligned (but not necessarily allowing for bullet drop, windage, distance between the direction of the beam and the axis of the barrel, and the target mobility while the bullet travels). Most laser sights use a red laser diode. Others use an infrared diode to produce a dot invisible to the naked human eye but detectable with night vision devices. The firearms adaptive target acquisition module LLM01 laser light module combines visible and infrared laser diodes. In the late 1990s, green diode pumped solid state laser (DPSS) laser sights (532 nm) became available. Modern laser sights are small and light enough for attachment to the firearms. In 2007, LaserMax, a company specializing in manufacturing lasers for military and police firearms, introduced the first mass-production green laser available for small arms. This laser mounts to the underside of a handgun or long arm on the accessory rail. The green laser is supposed to be more visible than the red laser in bright lighting conditions because, for the same wattage, green light appears brighter than red light. A non-lethal laser weapon was developed by the U.S. Air Force to temporarily impair an adversary’s ability to fire a weapon or to otherwise threaten enemy forces. 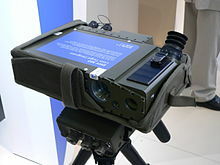 This unit illuminates an opponent with harmless low-power laser light and can have the effect of dazzling or disorienting the subject or causing them to flee. Several types of dazzlers are now available, and some have been used in combat. There remains the possibility of using lasers to blind, since this requires such lower power levels, and is easily achievable in a man-portable unit. However, most nations regard the deliberate permanent blinding of the enemy as forbidden by the rules of war (see Protocol on Blinding Laser Weapons). Although several nations have developed blinding laser weapons, such as China’s ZM-87, none of these are believed to have made it past the prototype stage. In addition to the applications that crossover with military applications, a widely known law enforcement use of lasers is for lidar to measure the speed of vehicles. A holographic weapon sight uses a laser diode to illuminate a hologram of a reticle built into a flat glass optical window of the sight. The user looks through the optical window and sees a cross hair reticle image superimposed at a distance on the field of view. Cosmetic surgery (removing tattoos, scars, stretch marks, sunspots, wrinkles, birthmarks, and hairs): see laser hair removal. Laser types used in dermatology include ruby (694 nm), alexandrite (755 nm), pulsed diode array (810 nm), Nd:YAG (1064 nm), Ho:YAG (2090 nm), and Er:YAG (2940 nm). “No-Touch” removal of tumors, especially of the brain and spinal cord. Industrial laser applications can be divided into two categories depending on the power of the laser: material processing and micro-material processing. In material processing, lasers with average optical power above 1 kilowatt are used mainly for industrial materials processing applications. Beyond this power threshold there are thermal issues related to the optics that separate these lasers from their lower-power counterparts. Laser systems in the 50-300W range are used primarily for pumping, plastic welding and soldering applications. Lasers above 300W are used in brazing, thin metal welding, and sheet metal cutting applications. The required brightness (as measured in by the beam parameter product) is higher for cutting applications than for brazing and thin metal welding. High power applications, such as hardening, cladding, and deep penetrating welding, require multiple kW of optical power, and are used in a broad range of industrial processes. Micro material processing is a category that includes all laser material processing applications under 1 kilowatt. The use of lasers in Micro Materials Processing has found broad application in the development and manufacturing of screens for smartphones, tablet computers, and LED TVs. Writing subtitles onto motion picture films. 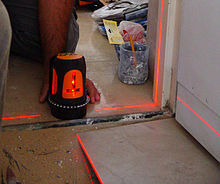 Laser line levels are used in surveying and construction. Lasers are also used for guidance for aircraft. Extensively in both consumer and industrial imaging equipment. In laser printers: gas and diode lasers play a key role in manufacturing high resolution printing plates and in image scanning equipment. Diode lasers are used as a lightswitch in industry, with a laser beam and a receiver which will switch on or off when the beam is interrupted, and because a laser can keep the light intensity over larger distances than a normal light, and is more precise than a normal light it can be used for product detection in automated production. In surveying and construction, the laser level is affixed to a tripod, leveled and then spun to illuminate a horizontal plane. The laser beam projector employs a rotating head with a mirror for sweeping the laser beam about a vertical axis. If the mirror is not self-leveling, it is provided with visually readable level vials and manually adjustable screws for orienting the projector. A staff carried by the operator is equipped with a movable sensor, which can detect the laser beam and gives a signal when the sensor is in line with the beam (usually an audible beep). The position of the sensor on the graduated staff allows comparison of elevations between different points on the terrain. A tower-mounted laser level is used in combination with a sensor on a wheel tractor-scraper in the process of land laser leveling to bring land (for example, an agricultural field) to near-flatness with a slight grade for drainage. The laser line level was invented in 1996 by Steve J. Orosz, Jr. This type of level does not require a heavy motor to create the illusion of a line from a dot, rather, it uses a lens to transform the dot into a line. Laser beams are used to disperse birds from agricultural land, industrial sites, rooftops and from airport runways. Birds tend to perceive the laser beam as a physical stick. By moving the laser beam towards the birds, they get scared and fly away. On the market are manual operated laser torches or automated robots to move the laser beam automatically. The surface of a test target is instantly vaporized and bursts into flame upon irradiation by a high power continuous wave carbon dioxide laser emitting tens of kilowatts of far infraredlight. Note the operator is standing behind sheets of plexiglas, which is opaque in the far infrared. 510–525 nm – Green diodes recently (2010) developed by Nichia and OSRAM for laser projectors.